One of my favorite genres of all time is the Metroidvania. Like many gamers, it all started with Super Metroid, but my passion was also reinforced by the glorious period of time where Castlevania started to adopt that style, all beginning with the incredible Symphony of the Night. As a result of my fandom, I do a lot of research into upcoming Metroidvanias, and do my best to follow their progress. So it was to my utter surprise that one came out of nowhere and slapped me across the face, demanding my attention. It wasn’t just a Metroidvania, it was a procedurally generated one with roguelike aspects. That game is called A Robot Named Fight. 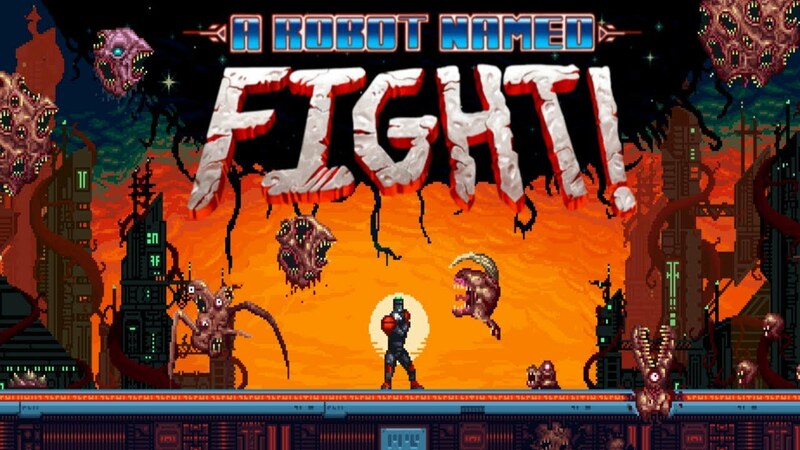 Drawn, programmed and created by the one man team of Matt Bitner (with some assistance from his lovely wife), A Robot Named Fight is a tribute to many games he loved from the good old days of the SNES. 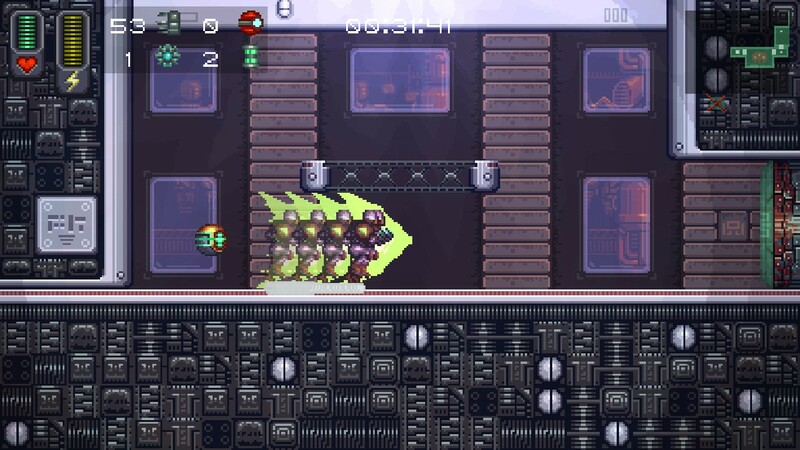 That inspiration shows in how it borrows the winning aspects of many games, such as Super Metroid and Contra. At first glance it would be easy to make the erroneous claim that the game is just wilfully copying those games, but that couldn’t be further from the truth. You need to appreciate that Matt spent the time to teach himself many aspects of game creation while making A Robot Named Fight, and while you’ll be familiar with some parts of the game, it was more of a delightful mash up of recognizable features than theft. After playing the game for six hours, I can say with confidence that it more than stands up on the merits of its own ideas, and you’ll quickly look past those features which may remind you of older games. With that out of the way, let’s talk about the meat of the game. The basic premise is that robots have become the dominant members of society and have heralded in a age of prosperity. Enter the hideous Megabeast, a cancerous collection of mutant horrors, which it literally rains upon the land in endless horrifying combinations. Robot society is devastated by this assault, not least of all because the legions of the Megabeast are capable of infesting and controlling some robots. Enter our hero, a nameless plucky robot determined to slay the Megabeast, and in so doing earn the distinction of being named Fight. It’s a little silly and very 90s, but the plot provided just enough motivation to get drawn into the game. 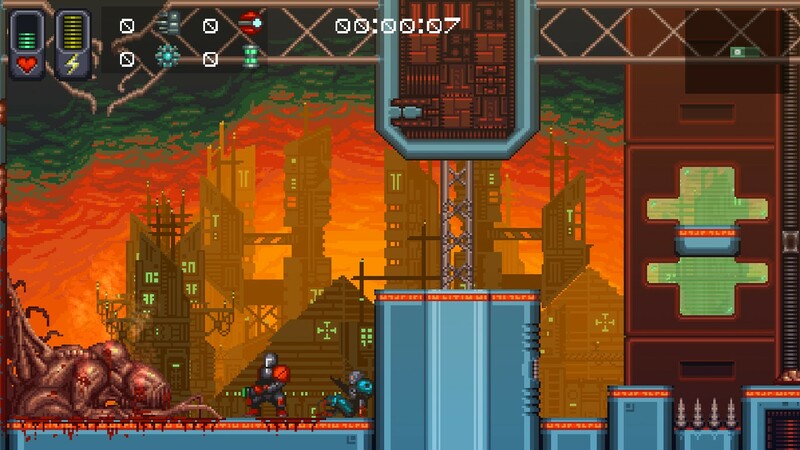 Like any Metroidvania, the whole point is the action and exploration, and A Robot Named Fight doesn’t disappoint. 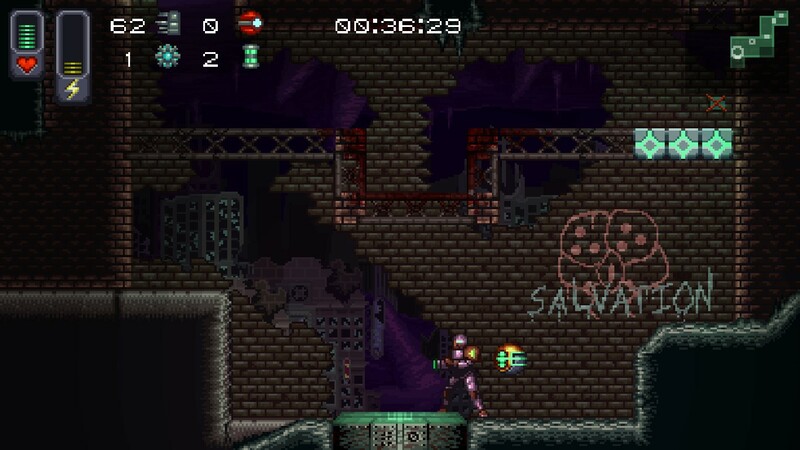 A great part of exploration is finding odd graffiti which gives hints to the lore behind the game. I said earlier that the game is procedurally generated, and that’s very true, but with some provisos. 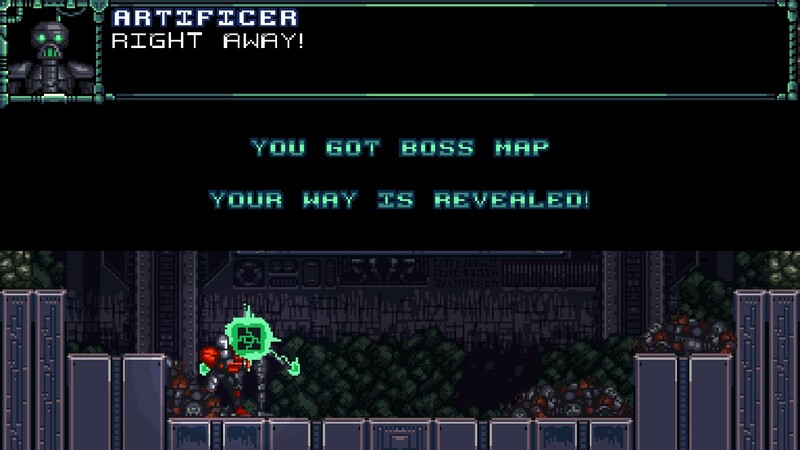 Though the layout and weapons you find on a given run are totally random, the basic order in which you proceed is not. You always start at the same opening stage, working your way to the Caves, then the Factory, down into the Buried City, and then back to the beginning to finish things. That probably sounds like a short jaunt, and while that’s true, the game has ways to keep things going. Every level you discover and every boss you first defeat unlocks new content, from weapons and upgrades you can find on subsequent runs to save stations you can use. In essence, the farther you get, the more the game world expands and becomes more complex. If you find a dark room, you’ll need to find a Bright Shell to illuminate it. Can’t proceed through a narrow tunnel? Find a Arachnomorph transformation! While you can beat the game in less than an hour, it will take time to get powerful enough to successfully do so. I spent a good 3 hours trying and dying again and again until I had unlocked enough upgrades and gotten the perfect weapon and skill setup (Infinijump, Flamethrower, Buzzsaw and Tri Orb) to take on and beat the filthy Megabeast, and managed to do so in just over 51 minutes. So it’s both a game with good amounts of exploration and combat as well as a game that can be speedrun for fun. Nothing wakes you up like the smell of roasted Megabeast in the morning! The procedural generation has good and bad aspects. The good is that you’ll be given different upgrades at different points in the game. 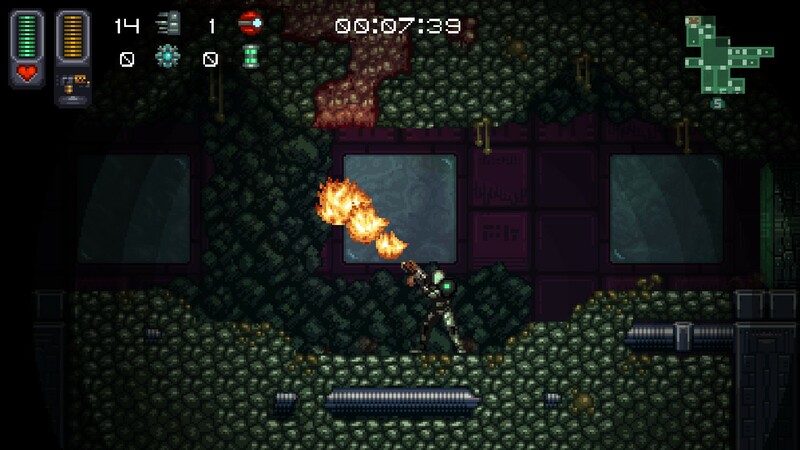 One run I got a flamethrower that could unlock flesh covered doors as well as do burn damage on foes; another time I got a slide move that took me under tight tunnels, and yet another I got an electrical blast that could shoot through walls to trigger switches. I loved this variety, as the same basic goals can be accomplished a million different ways, and that makes each run an unpredictable delight. The bad is that sometimes it seemed that I was locked out of progressing forward. Multiple times I came to a room where the way forward was blocked by a huge pillar, and since I had no upgrades at that early point, I couldn’t go farther. I forcibly restarted several times until I had the bright idea that maybe there was a hidden passage. Sure enough, by shooting at the ceiling I revealed a way forward, a technique that has worked ever since. This was to the game’s credit, as the way it unveils the stages teaches players what to expect and how to think critically. Like in Super Metroid, there are lots of locked doors and hidden paths, and diligence and patience will always reward you with a way forward. While I did occasionally find that the game would create rooms where entering would immediately put me right next to an enemy, instantly inflicting damage and even killing me one time, this was the exception and not the norm. Overall the procedural generation is well implemented and keeps things fresh. Combined with the intuitive controls found when paired with an XBox 360 controller, the game proceeds at a brisk pace. The more you unlock, the better your chances for success.